I am no juicing expert, but I have gotten into juicing — in a rather convoluted way. You see, I'm a bit of a tightwad and so I see no sense in paying a juice store to do something I can do for far less money on my own. The irony is in how much I've spent on actual juicers. I started out with a Breville centrifugal juicer. When it busted I got a Ninja Bullet. 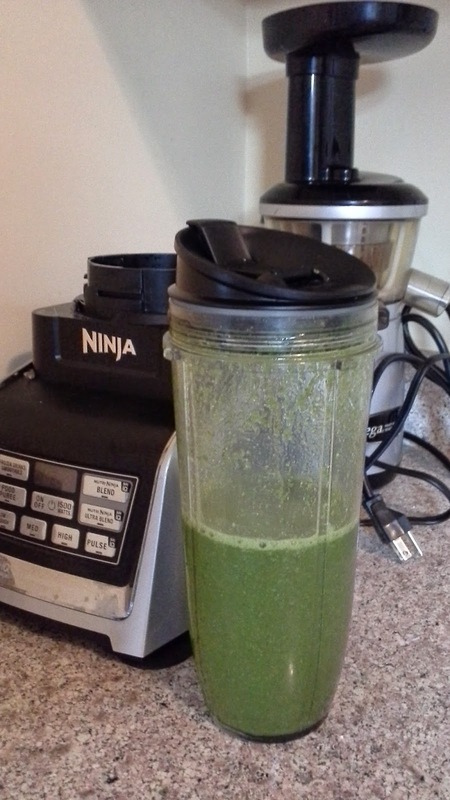 Then when the Ninja busted (from me cramming too much into each jar) I went for the big bucks and got a Vitamix so that I could emulsify and keep the fiber. But I got tired of so much fiber and so I went out and got an Omega cold press juicer to keep all those nutrients. Finally, I received a free, new Ninja Auto IQ Blender, which I fell in love with. Yes, I've spent a lot of money on juicers for being a tightwad. When I say that I'm not an expert, it's mostly because I don't make a variety of good tasting juices that I switch up each day. No, I keep things simple. I know that you should have mostly vegetables because fruit adds calories, so my juices are pretty green and veggie filled. My routine consists of going to the farmers market on Sunday morning, washing my purchases, then juicing or prepping for the entire week's worth of juices. Yes, my juices pretty much taste the same all the time, but I don't care. I'm getting my nutrients. What do I put in? Typically I go to the farmers market and buy the following (1 bunch each): kale, cilantro, carrots (including the greens), celery, parsley, sometimes mint, a few cucumbers, green apples, sometimes kiwis. At home I'm lucky enough to have a giant grapefruit and lemon tree to take care of the citrus. Citrus is important to cut that green, leafy taste. I'll also add the following at home, varying upon my mood: chia seed, tumeric and coconut oil (they need each other to work), cayenne pepper, pineapple, and ginger. As you can see, my juice is veggie heavy. I juice on Sundays and have juices every day for the rest of the week. And I don't lose much nutritional value because I freeze everything. Over the course of the last year I have developed three different methods for doing this. Each has its own merits. Sometimes it's a matter of how lazy I am and sometimes it's a matter of if I want a lot of fiber or do I just want the juice. The common denominator is that I'm not interested in taking time every day to juice and clean juicers. I'd rather clean up the whole mess just one time. Mason jars can be put in the freezer because the glass is so thick. The key things to remember is that you must use the wide mouth jars and you must leave an air gap because liquids expand. Forget the air gap and the freezing liquid could make your jar crack or explode in your freezer. Mason jars are best used for saving pure juices versus all the fiber in emulsification. I use 1 pint (2 cups) jars. After I get all my juices squeezed and have diluted them with a bit of water to stretch them out and tone down the strength a bit, I pour it into the jars, leaving a gap, and quickly seal them with lids and put them in the freezer. Done quickly enough, you won't need to worry about losing nutrients to oxidization. Each day you can take out a serving of juice and let it thaw out to drink it later. I find that if I take it with me to work, I can drink it mid morning or for lunch. I've heard that some people do this method but use juice bags to freeze in versus jars. I like jars. They are easy to clean and you aren't creating waste. I had been doing this method a lot recently and really like it. 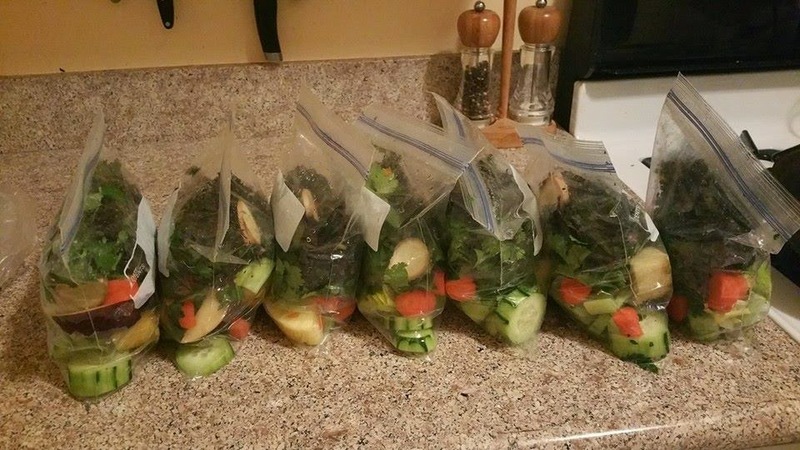 Cut all your vegetables and divide them among several baggies. In the morning grab a bag out of the freezer and throw it into the blender with water, citrus juice, and any extras like chia seed or protein powder. It will be icy cold from the frozen veggies and it's easy to quickly rinse out a blender. I reuse all my baggies the next week. This is a method I started doing recently because I was getting tired of too much fiber again. I've been cold pressing all the greens and carrots. I pour the cold press juice into giant ice cube trays. These cubes are about 2" squares. 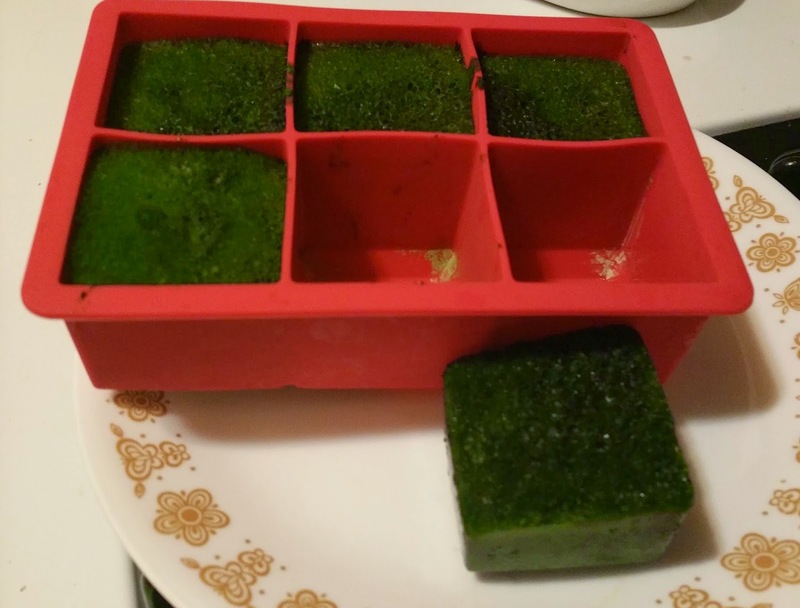 Each morning I grab a cube, half a cucumber, a stalk of celery, and then water, citrus juice, and chia seed. I blend it all up and this way I've got a lot of greens concentrated in the ice cubes but also some fiber from the cucumber and celery. Rinse the blender and done! Juicing doesn't have to be a big ordeal every day. Keep things simple and do one of the above methods once a week, when the produce is the freshest, and clean up once. Then enjoy your juices for the rest of the week with little effort.